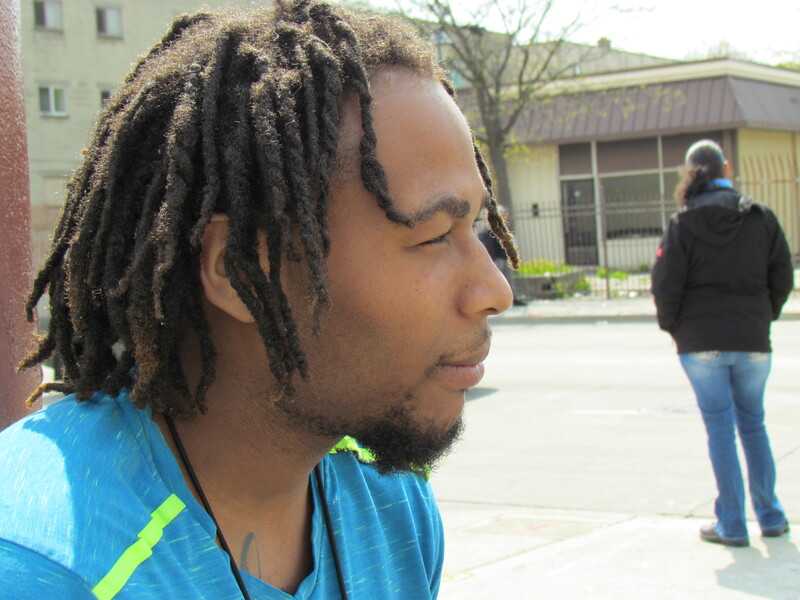 Keon Hamler sits up against a pole near a bus stop at 27th and Kilbourn. The stout 22-year-old quietly watches the hustle and bustle around him, as people come and go. “After I graduate, I wanna get into the music industry,” he says. Influenced by members of his family, Keon was writing rap lyrics, making beats and recording music as early as 8. Hamler has stayed “all around” but grew up on the east side of Milwaukee, staying, first, on Richards, then Concordia and 21st Street. And, from a young age, it’s been a challenge for Keon, who was hit by a car when he was 6. Hamler hasn’t found it easy to settle down, moving around a lot. He just quit his job as a security guard at Rainbow because the place kept getting robbed, and he says he didn’t feel safe. Still, he plans to get back to MATC by the fall. “I write about my life, what I’ve been through, what I had to go through to be where I’m at right now,” Keon says.